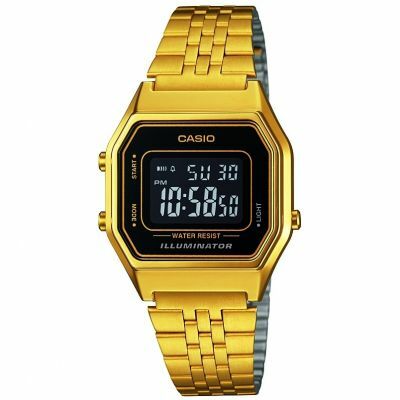 Ordered this watch for my brothers birthday at his request. I was very impressed at the turn around time. I ordered the watch on bank holiday Monday with standard delivery and the correct order arrived the next morning. Would be very happy to order from watch shop again! 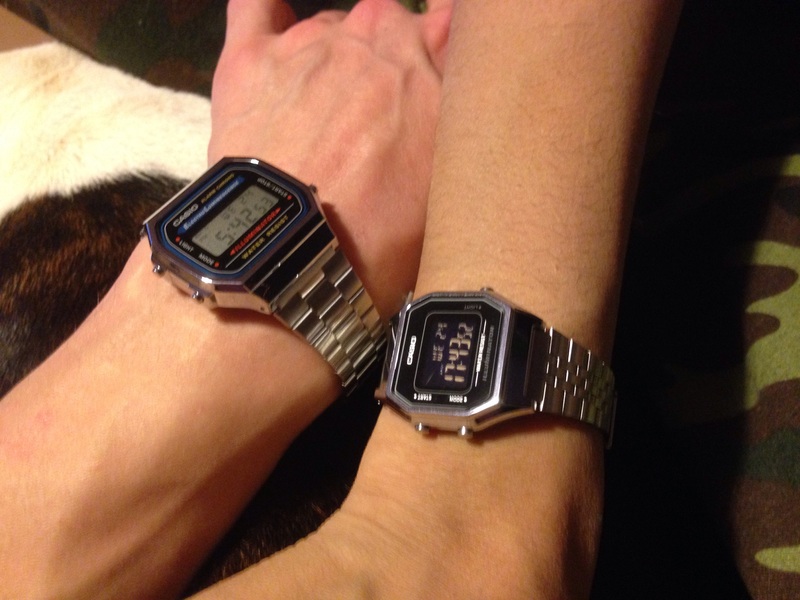 Great looking classic casio. My wife is very happy. iT LOOKS SO VINTAGE AND CHIC. MY FRIENDS COMPLEMENTED ON IT SO MUCH. CLEARLY TELLING YOU THE TIME AND DATE IS JUST WHAT I GOT. THANKS! Was for a simple additional christmas gift. Went down really well. Really versatile watch. Simple and something that can easily be worn every day! 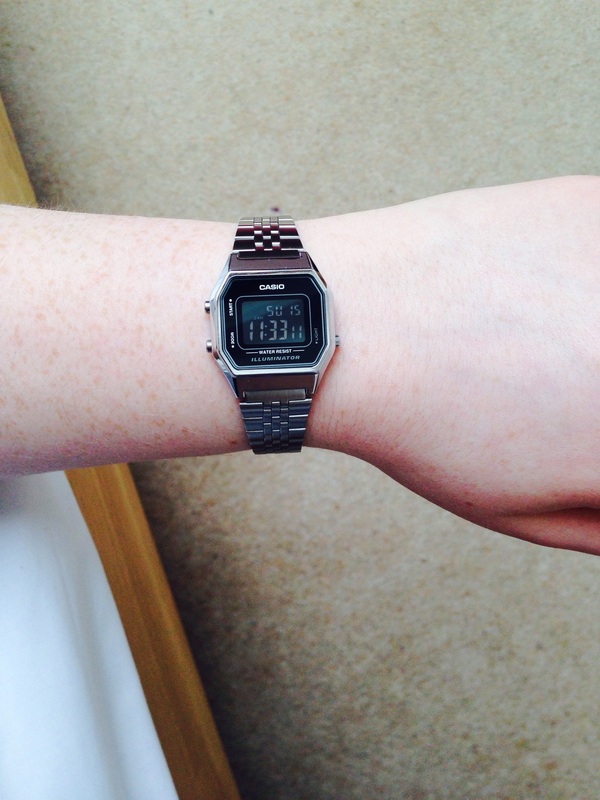 I have wanted a retro styled watch for a while. I went for the version with light so I can see the time at glance at night. For me this is a handy feature. The Display against the dark face comes with lighter faced models too! is very clear and easy to read. 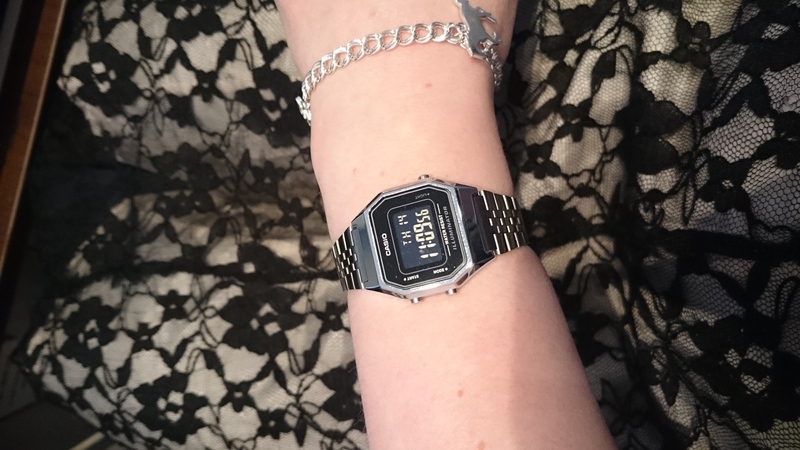 I really only use this item as a watch to tell the time and for that retro look, but the stopwatch and alarm function is very handy should I need them in the future. Also worth mentioning is the brilliant strap adjuster which was quickly and easily adjusted to fit my wrist. The scope of adjustment is huge to suit most peoples wrist size. I love it. Brilliant service. Breathtaking speed of delivery. Product just as my daughter wanted! Love this watch! It is stylish and can be worn smart or casual. Added bonus is lighting up the time in the early hours when getting up for my baby daughter! I purchased the gold one a couple months ago and simple fell in love with it, so I had to get the silver one! Very nice and slick! Always stand out and they look great with any outfit! Quality is amazing for such a price as well. I was very happy with the quality of service i received from this company. delivery was very good and the item arrived very well packaged and protected. The watch itself is very stylish, is great quality and looks far more expensive than it is. I did have a little difficulty setting up time/date etc, but that was purely because i have arthritis and as i would term the face small i found this quite awkward to do myself so my son helped, but once done, no other problems were encountered. The clasp for the bracelet was easy to do and for my wrist the fit was very good. All in all a great product at a good price. Many thanks for the watch. To be perfectly honest, its a little smaller than I wanted but I was so impressed with the customer service, the emails notifying when it was being shipped and when it would arrive, and the ease of returning it if I so wanted, that I thought I would keep it and give it to my daughter. Because of the ease of transaction and quality of service, I was so impressed that instead of returning it, it has now become an unintended gift for my daughter, who by the way, loves it and cant stop being thanking me. So thanks to you guys. Ill try a watch first and then definitely be buying it from watch shop as Im very happy to spend my money with you. Lovely little watch, nice and simple. Smaller than I thought though. Delivered really quickly though with no fuss. Would use watchshop again. A very quick and easy service. The watch was received when I expected it and I was updated with the whereabouts of where my product was before receiving it. I would use this site again. Great feeling watch. Feels light to wear, and easy to read the face. Havent used the alarm and stopwatch yet, but its easy to work out how to use these features. Prompt delivery and great quality. Very satisfied with the whole experience. 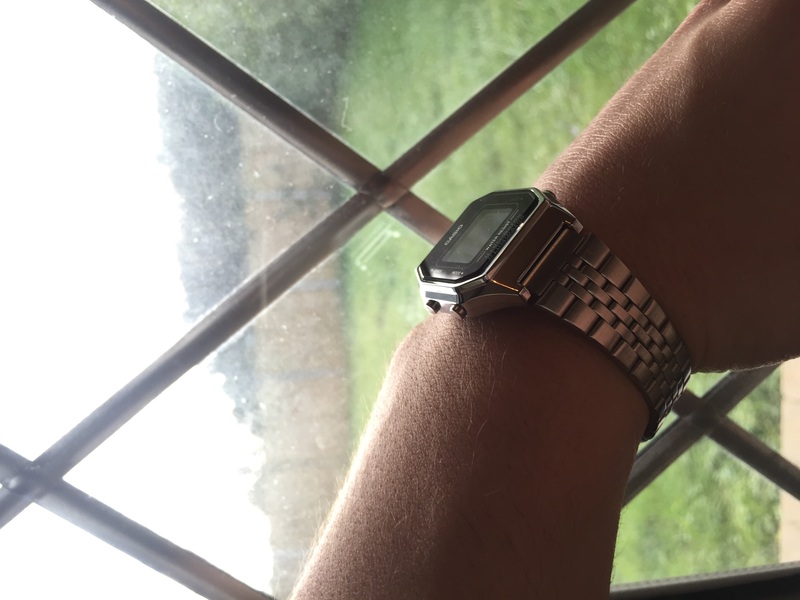 Really nice little watch, face is quite small but have a small wrist so it is perfect. Easy to set up and adjust strap. The watch is very nice, however there is a lot of excess band as my wrist is small. Will need to have some links removed. An great little watch and a great price from The Watch Shop. Lovely watch, easy to use and looks great when wearing, however it is very small and so I wouldnt say it was suitable as a gents watch. It was a gift for my partner, but I ended up keeping it as it was too small for him, but looked fab on me! The watch is very smart looking and practical. operating instructions are easy to understand. Great price for an everyday watch. The watch was much smaller than I imagined. You can hardly see the time as a result, and you need the aid of the backlight to see it properly which only comes on for a few seconds if that. Poor quality, buy cheap and buy twice. Love this watch! Super clear display the straps fit like a dream and the delivery was super quick was even more impressed at how protected the package was limiting the amount of damage possible in transit! Couldnt be more happier with my purchase! Bargain price for a good brand name would use again! Great item. Easy to set up &ages tires such as stop watch , alarm & date & day. Amber light & easy to adjust the strap. Totally love the watch! Good price and in good condition. No problems with the strap very easy to adjust. I wore it twice already and fits me well. Great watch. Smaller than expected but looks good. Fits well and works as expected. This is a great looking classic Cassio watch. It is the perfect size for a womans wrist, the face is not too small nor is it big and bulky. Very easy to read and use. Timeless classic and is easily one of The favourite watches I own. Great watch, bit thicker than I thought it would be. Its a lovely fit and looks very smart, although I do have to use the backlight frequently as the numbers can be difficult to read. Good smart everyday watch! Fantastic item, looks Lovely, superb value for money, looks stylish, great features with a light, alarm clock and stop watch. 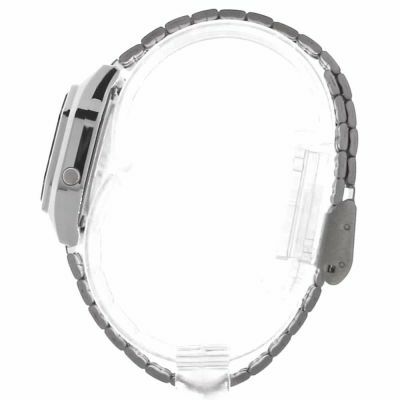 This is a very good watch and the fact that you can adjust the strap easily is very helpful. The only minus about it is that, I have a very small wrist and now I have a lot of excess of strap that is hard to hide. Watch arrived in perfect condition. Kept up to date with delivery status and arrived on time. Packaging kept the watch protected. Absolutely brilliant. I brought this as a gift for my girlfriend for a holiday traveling around Thailand. Its perfect...small, light, compact and inexpensive, but the quality is far from cheap. A old school classic! The watch strap is easy to adjust to your size and can do it yourself, so no need to go to a shop to get it adjusted. Perfecto. very neat and compact watch ideal for my needs looks neat on my wrist. just the right style for someone who has a slim wrist. The watch itself was nice but it was smaller than I expected, I knew it wouldnt be big but it came out tiny. So far so good with the product. Bought for Xmas present for my 14 year old daughter. Really impressed, nice size face & colour. Love the strap. Nice watch not too big. the item is really nice! the watch face is small and I would say more feminine! its easy to use and comes in a nice box all protected. has a little screen light which works really well. definitely wouldnt sort a male as is a very small watch. easy to put on an do up and undo! doesnt look cheap and the colours are just like the picture. definitely worth the buy! Came very quickly, very well protected in the packaging. Watch was a lot smaller than I originally expected, especially as Im giving it to a male for Christmas. 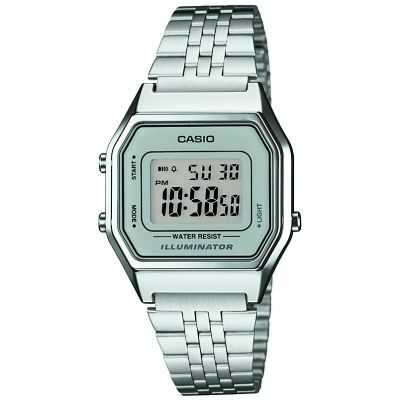 It is a Unisex Casio Classic Shiny Silver Alarm Chronograph Watch. It includes an alarm and stopwatch, as well as being water resistance. The watch is chic, elegant yet sophisticated. It fits all wrist sizes with an easy adjustable strap. I cant wait the others in the series. 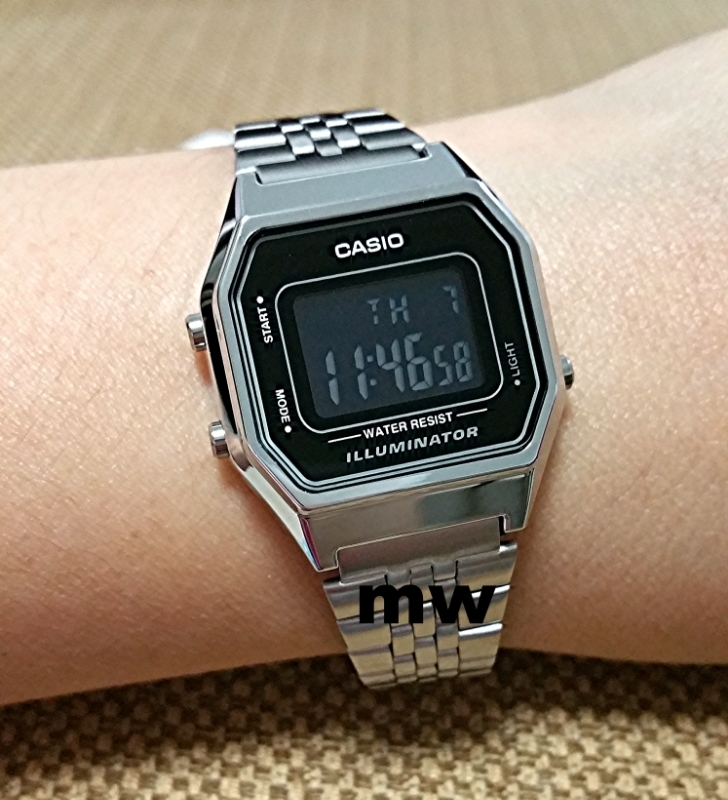 I bought it to myself as I love watches and was really excited to have a Casio Classic watch. It is very light and comfortable to wear and also small which I like since I never had any small watches before. The only down side is that I expected the body of the watch also in stainless steel like the bracelet and not plastic as if is but overall a nice little watch. Very nice watch. Face was smaller then I imagined, strap is a little fiddly and took me a while to get used to. Can be slightly hard to read outside but I knew this before purchasing. Not bad for the £17 I paid. The watch is great, just what I needed it for, and had more features than was listed. Great price too. Its strap is a bit thinner than I thought, but still a nice stainless steel piece. The watch was listed as unisex, however its size suggests to me that is it more suited to females. 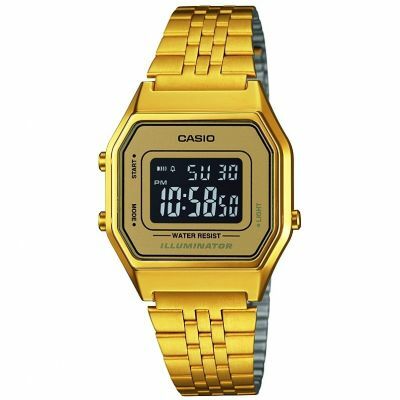 Only ordered the Casio watch yesterday delivery was very quick the Casio watch is a nice silver very stylish and can go with many outfits the watch did look small when I opened it but once I put it on my wrist it look good and was easily fitted well I recommend the watch good price good delivery and a good watch. This watch is perfect for my wrist. I didnt need to take it to a shop to adjust as you can do it yourself. It has an alarm, led light and is excellent value for money.